Catboy by Benji Nate is a compilation of the long-running VICE.com comic infused with some new exclusive and unreleased material. Olive’s best friend in the world is her cat, Henry. She makes a wish that he become a real person and like most carelessly planned wishes, she regrets it when it comes true. Henry is the size of a human but with the body, thoughts, and needs of a cat. This can make even the simplest of tasks, like using the bathroom complicated. He and Olive go about their daily routine and Olive’s struggling artist lifestyle mixed with Henry’s daily confusions make for an endearing friendship full of laughs and surprises. Henry dresses in girl’s clothing (most likely borrowing Olive’s), and their fashion adds quirky flair to their story. One full page featuring their fashion appears before each section of the book. This is a great read for teens and adults who are cat lovers. 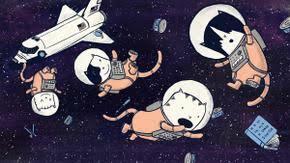 CatStronauts: Mission Moon by Drew Brockington is hilarious, spunky and memorable fun. The world has an energy shortage and the only way to solve the problem is for someone to go to the moon and set up solar panels. The President of the United States calls on the most qualified individuals that he can find, the CatStronauts. The CatStronauts begin their training and we are introduced to their unique skill-sets and foibles which come in handy at unexpected times. For example, Waffles is always seeking food and Blanket is a genius technician who can’t bear to leave his robot behind even when he’s ordered to do so. The full-color illustrations are energetic and the block shape of the cats along with their priceless expressions add an emotional journey to the adventure. This is the first in a series that is great fun for middle-grade readers and up.